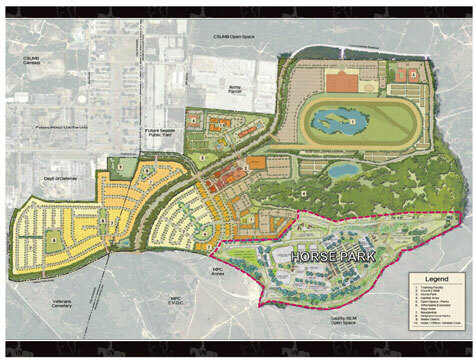 The Monterey Downs and Horse Park components of the proposed project includes the following: a 225,000 square foot horse training facility that would be comprised of a track and stabling area, ancillary buildings, and a 6,500 seat sports arena and grandstand; a 330,000 square-foot commercial center; a 15,000 square-foot horse park that would be comprised of a visitors center, office space, veterinary clinic, and horse stables; two affordable extended stay hotels with a total of 256 units; 1,280 residential units ranging from apartments to single family residential homes; a 100,000 square foot office park; a 200-room (100,000 square foot) hotel; a 5,000 square foot tennis and swim club; a 73-acre habitat preservation area; and 74 acres dedicated to open space and parks and infrastructure. The project applicant is Monterey Downs, LLC. 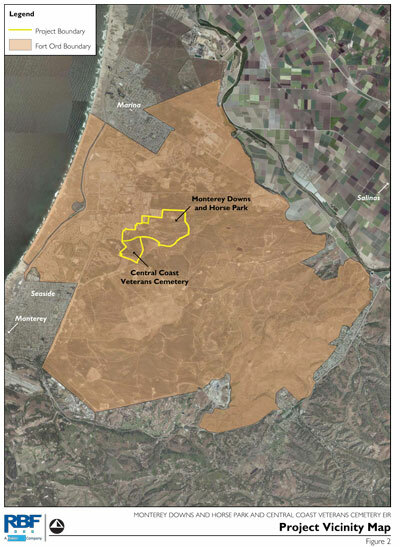 The Monterey Downs site including the Veteran’s Cemetery is approximately 710 acres and the development proposal consists of a horse training facility, horse track, sports arena, commercial center, multiple hotels, and an office park. The City of Seaside is the lead agency. Seaside City Council rescinds all project approvals and the EIR in a 5-0 vote in December 2016. Monterey Downs developer issues letter to City of Seaside November 30, 2016 terminating all negotiations and actions related to the project. The City issues a Press Release. Seaside City Council approves in a 3-2 vote the Monterey Downs development in November 2016. LandWatch and others gear up for a referendum to overturn the approvals and files a lawsuit in conjunction with Keep Fort Ord Wild over an inadequate EIR. The Seaside Board of Architectural Review recommended approval of the project at its August 2016 meeting. The City of Seaside released the Final EIR on July 29, 2016. The Draft Environmental Impact Report was released March 31, 2015. The comment period has been extended to June 19, 2015. A Notice of Preparation (1.7M PDF file) was circulated September 2012 to October 2012. The proposed Monterey Downs project would be annexed into the City of Seaside and includes portions of the former Fort Ord Military Base. 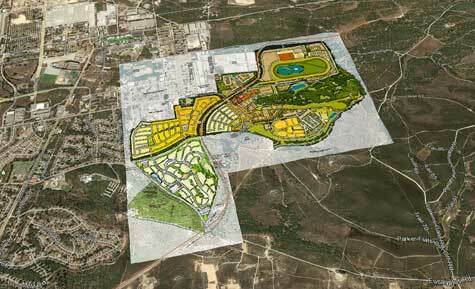 The proposed Monterey Downs project and development layout. 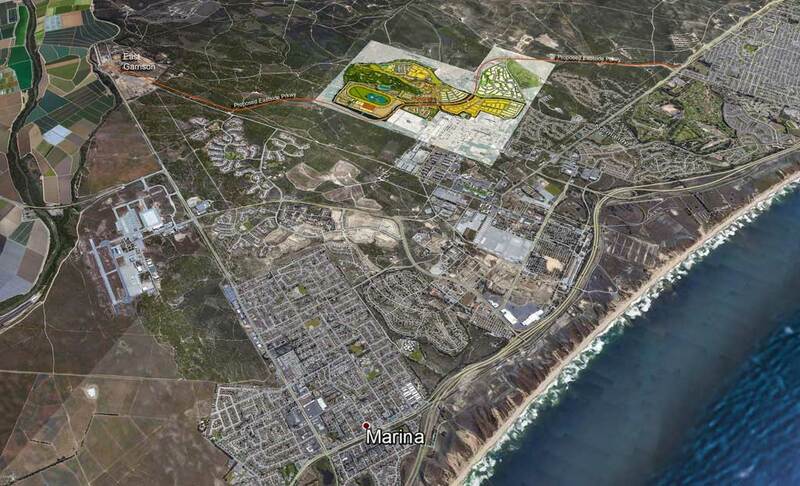 The proposed Monterey Downs project in relationship to existing communities and the City of Marina. The proposed Monterey Downs project looking northeast with Parker Flats, Gigling, and General Jim Moore Blvd. in context. The proposed Monterey Downs project looking southeast with Parker Flats Cutoff and the proposed Eastside Parkway in context. The proposed Monterey Downs project close up. The sports arena, housing, proposed roads, commercial area and overall layout are shown. The DEIR admits there isn't enough water for all six phases of the project. Instead, there may only be enough water for the first three. 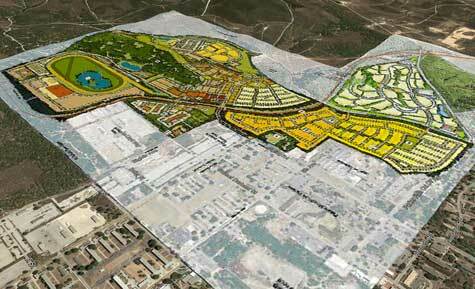 The project plans to use water from the already overdrafted Salinas Valley Groundwater Basin. The City of Seaside indicates it would they would be willing to provide water from other approved, but not yet built projects, in the City. Sixty-one unavoidable and significant traffic impacts are identified to local intersections, Highway 1 and its on and off-ramps. These impacts would be permanent and unmitigated to the surrounding area residents. Numerous impacts would occur if only a portion of the project is built, and this is a possible scenario given the inadequate water supply. The DEIR fails to analyze these impacts. 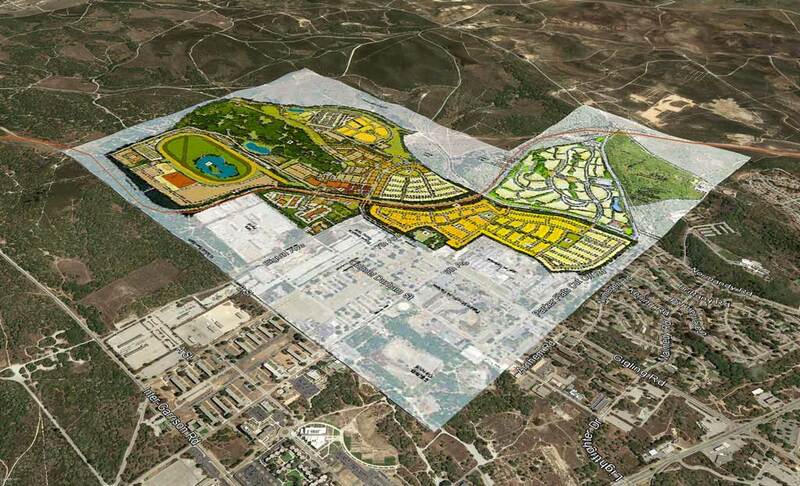 For example the Monterey Downs is a mixed use project and determined that 28% of the car trips will be internal (staying within the project). However, there is no analysis of what the traffic impacts will be if only the residential phases are built. There is also no analysis of the impacts during special events. In fact, the Special Events Traffic and Emergency Management Plan is being deferred until later. Due to the massive scope of the project, 41,000 oak trees would be removed from the project site. Trees reduce greenhouse gas (GHG) emissions by absorbing carbon dioxide and converting it to oxygen. No analysis was conducted to determine the GHG impacts for the extensive loss of habitat. Additionally, the loss of carbon has not been calculated for when the trees are cut down and removed. The project proposes a horse racing facility, but fails to quantify the greenhouse gas impacts from horse-generated manure. Methane contained in the manure is a more potent GHG than carbon dioxide. Join the effort by collecting signatures and donate for this critical and time sensitive issue today! Are We Suckers for Monterey Downs? LandWatch and Sustainable Seaside partnered to offer a workshop focused on the California Environmental Quality Act. The workshop was filmed and has been posted on YouTube for the public to view.